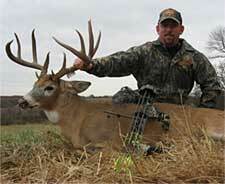 Performance Outdoors offers fantastic trophy whitetail and turkey hunting in west cental Illnois and southern Iowa. Performance Outdoors: Known for the BUCKS, but the GOBBLERS are hot too!! Although West-Central Illinois and Southern Iowa are mostly known for Trophy Whitetail Bucks, we also have some of the best Wild Turkey hunting in the nation. Performance Outdoors offers guided and self-guided turkey hunts on the same farms and quality habitat that has made us the premiere outfitter for Monster Whitetails. At Performance Outdoors, we hunt a mixture of rolling hills, pastures, crop fields, and river bottoms. These hunts are with all the amenities you would expect from Performance Outdoors. The hunts include: guide (optional), maps and directions to farms, property aerial photos, comfortable lodging and accommodations. All non-residents must apply for turkey tags and this happens in the beginning of January of each year. Many hunters desire to hunt Illinois and Iowa on the same hunt. We can help you customize a hunt. Quaker Boy has been hunting with us for years. Quaker Boy pro staffer, Bob Wozniak says “The hunting is some of the best in the nation. It’s unbelievable. To date, I have had a 100% success on the client I have brought to Performance Outdoors for Spring Turkey Hunting.” Spring Turkey hunting is also a great time to learn some of the land you could hunt Giant Whitetail on. You might even be lucky enough to bump into a giant whitetail shed. 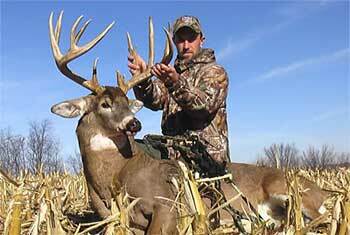 West-central Illinois is home of world record class Whitetails. Famous bucks, such as the Bryant Buck (304 inches) & the Macomb Monster (293 inches), were shot a stones throw from many of our farms. We hunt the best land of the top producing counties: Fulton and Hancock. Licenses are acquired through a DRAW, but since 1997 we have had nearly 100% success rate. We take away the headache of getting tags yourself, Performance Outdoors will get your tags for you. We offer archery, limited firearm, and combination hunts. Most farms have a minimum buck size of 125” for archery and 140” for gun. Hunters arrive in camp at 3pm the day before the hunt begins and hunt through the last day. Clients depart the next morning by 9am. Hunts are either Smart Scouter, guided (GUIDED CAMP) or semi-guided (DROP CAMP). RUT dates book very early so we advise booking as soon as you have made your decision to hunt with us. Performance Outdoors will also try to accommodate for special scheduling circumstance when possible. Southern Iowa is well known to any serious Trophy Whitetail Hunter. This area is home the current World Record (Lovstuen Buck, 304 7/8). Performance Outdoors operates in famous zone 5. Tags are by applications and draw only and it usually takes 2 years to get the tag. Iowa works on a preference point system, which means the more points you have the better your chance of getting drawn. Because of this, we recommend purchasing a point the years you do not plan to hunt Iowa. (Not actually applying for tag) Each applicant can purchase one point per year. This sets you in line for the year you want to hunt. Once you have accumulated enough points to get the tag, we will get you applied and scheduled for the hunt. Applications are due in May. Per- formance Outdoors can take the headache out of applying, by booking your hunt in advance. For more information on available dates and price quotes go to the Performance Outdoors web site below. To book a hunt now call: 800-996-0477 or 970-471-8233 or E mail.